The Israeli choke-hold on Gaza remains unrelenting as the death toll continues to rise since the Great March of Return began at the end of March. The border protests which were only supposed to run until the end of Ramadan, quickly escalated in the face of unprovoked Israeli aggression. More than 18,000 Palestinians have been wounded by Israeli sniper fire, tear gas and drone attacks. At least 164 deaths have been confirmed by health officials. The most recent protest at the time of writing, saw 3 Palestinians killed by Israeli drone attacks. At least 131 Palestinians were wounded by bullet fire. One of the dead included yet another paramedic. Following the June murder of paramedic Razan Al Najjar, Friday August 10th saw 26 year old paramedic Abdullah al-Qatiti murdered by Israeli forces. The previous Friday saw 220 injured and one killed. The week prior to this was a stark reminder to the world of the inhumanity and brutality of the Zionist entity. Over July 27 and 28, three Palestinians were murdered, including 2 children. Seventeen year old Mohmen al-Hams was shot in the chest while attending the border protests at Rafah. The previous day 12-year old Majdi Ramzi Kamal al-Sutra was shot to death. Despite the façade of international respectability as the ‘only democracy in the region’, the Israelis are literally child killers, the Fred West of international affairs. An additional 184 were wounded, including 14 children, 10 women, 4 paramedics and a journalist. These are the so-called ‘Hamas militants and terrorists’ being targeted. Saturday 14 July saw two further children killed in the largest daylight attack on Gaza since 2014. Air raids were carried out across Gaza. Fifteen-year-old Amir al-Nimra and sixteen-year-old Luay Kaheel were among the victims. We could go on listing the children killed by Israel recently. 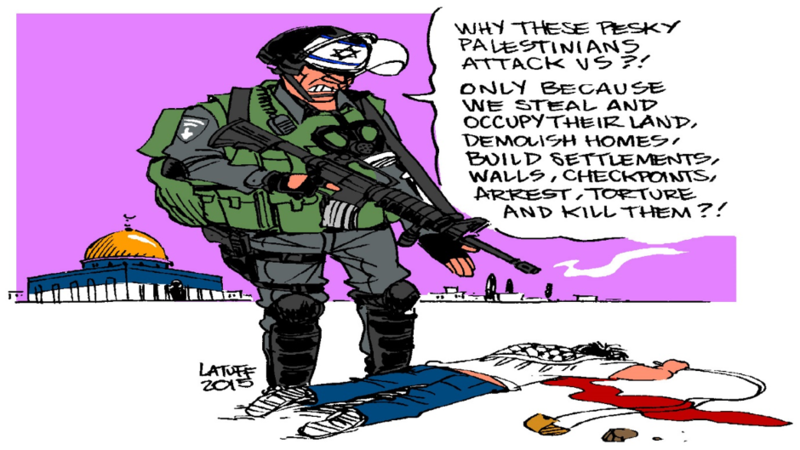 But this year Israel has murdered 30 Palestinian children in total, 24 from Gaza, 6 from the West Bank. With every additional death, the further normalised it becomes, the further Israel may act with impunity. In total 17,259 Palestinians have been injured in the protests (as of August 3 2018); 3,279 children and 1,553 women. A further 6,000 Palestinians languish in Israeli prisons, 300 of them children. So, whilst the elation shown at the release of 17-year-old Ahed Tamini from prison is totally understandable, attention needs to be brought to these many other cases of Israeli child abuse. Whereas only one Israeli soldier has ever been charged with killing a Palestinian child, these children can face up to 20 years in prison for the audacity of throwing a stone at heavily-armed occupiers. Israeli impunity is illuminated entirely by the fact that an Egyptian-brokered period of ‘calm’ was agreed between Israel and Hamas, coming in to effect at 12pm on 20 July. The so-called period of ‘calm’ has turned out to be a period of killing children and pregnant women. No agreement will be worth the paper it is written on unless it involves a power capable of reining in Israel. Such powers are few and far between. Which turns us to Trump’s ‘deal of the century’. For some time US foreign policy circles have been telling the world that a deal for Palestine is coming. Originally expected to be announced after Ramadan, the detail of the plan remains clouded in mystery. Speculation abounds, but educated estimations do not predict favourable terms for the Palestinians. The details are being put together by Trump’s son-in-law Jared Kushner, David Friedman the US ambassador to Israel, and Jason Greenblatt the Middle East Special Envoy. How three unashamedly pro-Israel individuals can possibly produce a ‘deal of the century’ capable of truly solving the Israel-Palestine issue, is beyond comprehension. First of all, the trio have all previously spoken in favour of Israeli settlement building. From such a starting point it is all too clear that they are incapable of producing a solution. Such a position is in flagrant contradiction with the Oslo Accords signed in 1993. The settlement issue was one of seven key issues on the table at Oslo. To ignore this is to ignore the existing framework for ‘peace’. In addition, Kushner and Friedman have also came out in favour of Israel’s recent Nation State Law, which promotes settlements as a key Israeli objective. The third undermining of Oslo by the US has been evident by the attack on the United Nations Relief and Works Agency for Palestine (UNRWA). Leaked extracts from Kushner’s emails show his intent to “disrupt” UNRWA. He also proposes terminating the refugee status of some 5 million Palestinians in countries like Jordan and Lebanon. The emails were sent in January 2018, the same month as Trump cut funding to UNRWA. With the Americans pressuring Arab states to strip Palestinians of refugee status, co-ordinated with cuts to UNRWA, there can be no coincidence here. Instead both must be seen as part of a wider, sinister US strategy to suffocate Palestine. UNRWA provides aid and services to Palestinian refugees who currently reside in host countries lacking the infrastructure to cope with the refugee population. This will leave millions of already poverty-stricken refugees in a helpless predicament. Adding insult to injury is the attempt to strip them of their refugee status, thereby stripping them of their one glimmer of hope: the right to return. Rather than forcefully evicted Palestinians being allowed to return home, Kushner and co. are committed to further settlement building, thereby creating further refugees, who will now be refugees in all but name. Again, the Palestinian hand is forced. For if UNRWA is closed down and the Palestinians are stripped of refugee status, this implies that the issue is settled. Like Jerusalem and settlement building, the refugee issue will be off the table in any deal (see Anne Irfan, ‘What Jared Kushner’s “deal of the century” would mean for Palestinian refugees’, The Conversation, 10 August 2018). “And they can’t just object or abstain as the PLO has done in recent years. American diplomats have already warned President Abbas to either step up or step aside. And to add insult to injury, de facto Saudi leader Mohammed bin Salman has also warned the Palestinians to either accept the American proposal or ‘shut up’. Despite recent reassurances from his father King Salman, the Saudi leader, just like his Emirati and Egyptian counterparts, is likely to continue to coordinate with Israel, even if that means leaving the Palestinians behind. “So, the Palestinian leaders would need to decide when the time comes: accept and negotiate for more albeit within a new tighter framework, or reject and suffer the consequences – isolation, retribution, or worse, replacement” (Marwan Bishara, Al Jazeera, 10 August 2018). A deal which is divorced from the Palestinian reality is doomed to failure. Imperialism’s solutions are no solutions. With the key issues of settlements, the status of refugees and Jerusalem off the table, little is on the table. There is little chance of Abbas being able to accept such a deal, and Hamas certainly won’t. Abbas has already called the deal the’ slap of the century’. Therefore the winner of this entire process will prove to be Israel and Netanyahu. Knowing the Palestinians could not accept these terms, Netanyahu can accept the deal, even if it contains things he does not like. The Zionists will be able to present themselves to the world as the pragmatists who want peace. 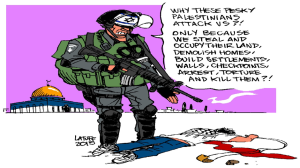 The Palestinians will be painted as unreasonable, irreparable anti-Semites committed to violence. So the narrative will proceed. Whatever the fanatical hopes of US imperialism and its Zionist stooges, such a scenario will not come to pass, for Palestinian resistance will in the end serve to frustrate this fantasy. Palestinians are fighting for their land, homes and hearths; they are resisting oppression and expropriation. They have got nowhere else to go. Through their struggle over the years, they have acted as the spearhead of the Arab people’s struggle for liberation against imperialism – a role they continue to perform to this day and are bound to do so in days to come. If US imperialism and Israeli Zionism do not sincerely implement the two-state solution in a meaningful way, Zionism will have to face the choice of accepting either a bi-national state in which Palestinian Arabs and Jews enjoy equal political and civil rights, or a Zionist state ruling over the Palestinian people through a system of apartheid, with a total denial of all rights to the Palestinian people and the perpetration of daily violence against them. Either option will spell doom for the whole idea of a Jewish state as envisioned by Zionism. The forward march of historical movement, demographics and world opinion are increasingly converging towards making the whole idea of a Jewish state a historical abortion. The Zionists and their imperialist masters know it. That is why they are frantically busy characterising anyone who opposes them, or even criticises them, as anti-Semitic. One has only to glance at the hysterical accusations levelled by Zionists against Jeremy Corbyn, leader of the Labour Party, to realise the panic that drives Zionism and the extent to which Zionists are prepared to go in pursuit of their racist policy and in defence of the racist state of Israel. However, even this campaign is only too likely to backfire, for decent people will perceive it for what it is – a revolting obscenity.